If you've been sitting tight, waiting desperately to connect your Mini-DisplayPort-bedecked Mac to your flashy HDTV through that fancy-pants HDMI connector, you're now in luck. Starting this Friday, online retailer Monoprice will be selling an adapter to bridge that gap for a mere $14. This dongle finally lets you watch that pesky protected HD content on pretty much any HD display you want (as long as the display is HDCP-compatible, naturally). 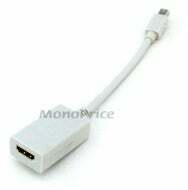 Monoprice is also selling Mini-DisplayPort-to-DVI and Mini-DisplayPort-to-VGA for $15 and $19 respectively, if you're looking to pick up a different adapter (Apple sells its version of each of those for $29). While we haven't taken this for a test drive, gadget blog Gizmodo apparently has; they say that it works precisely as advertised. If you do shell out for this adapter, let us known in the comments how it's working out for you.